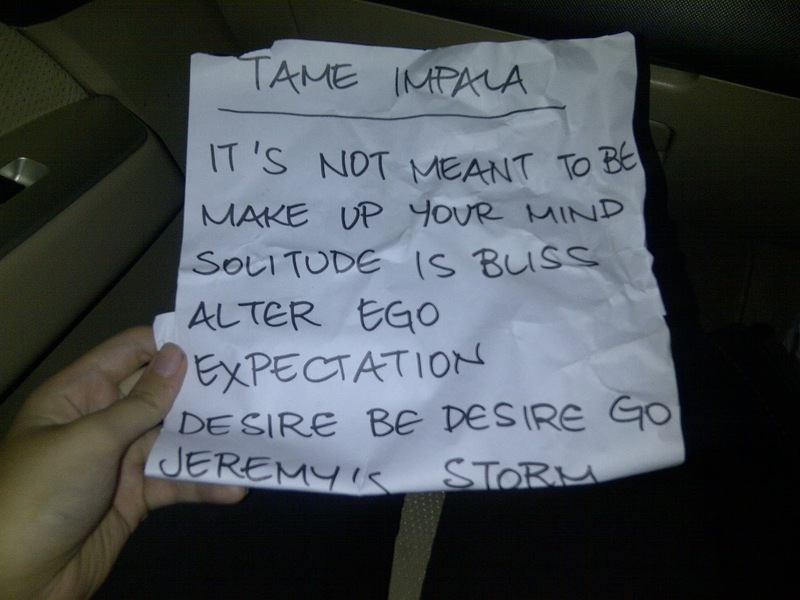 It's Not Meant To Be// Tame Impala. 29 October 2011. It was yet another Beatfest after about 7 months. I went to both this year. After struggling with a lot of things, after worrying about pretty much everything in the gig, I successfully went through the doors of Bengkel Night Park to watch Tame Impala with two of my friends, Katy and Tassa. It was one of the nicest gig I ever went to. Didn't regret a single thing. This was the one and only concert that I went to, that I didn't excrete a single drop of sweat because the crowd was really nice. I was at the very front row even though I didn't arrive THAT early. It was sort of... you know. Sepi. I didn't expect it to be like that. So yeah. !!! 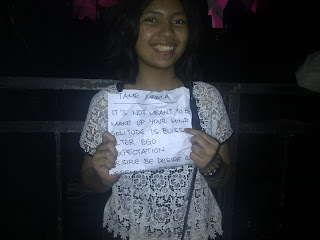 's vocalist, Nic, jumped from the barricade into the crowd right beside me so yeah I touched him a couple of times haha. 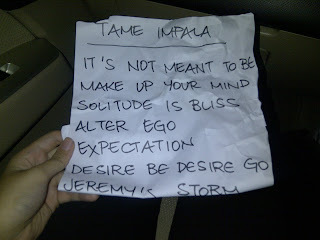 What's even nicer is that I got Tame Impala's set list after the show!